Just north of Phoenix is the city of Scottsdale, which is regarded as an upscale tourist and shopping area. In the past 10 yrs or so, Scottsdale has become the shopping destination for the Phoenix metropolitan area and as well as for the southwest. The real estate market in Scottsdale is among the most expensive in the US. In 2005, Scottsdale was ranked 10th with $594 million in luxury home sales. Old Scottsdale is a quaint area of narrow winding streets with restaurants, bars, nightclubs and galleries. It has become home to more than 125 art galleries. 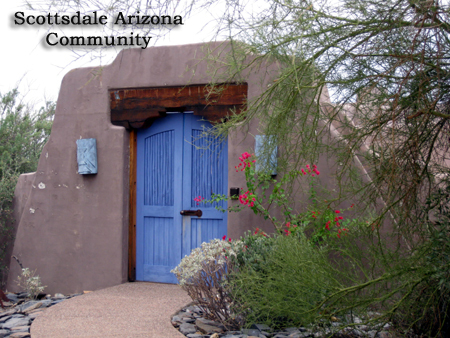 Thursday evenings is the ”art walk” sponsored by the Scottsdale Gallery Association. Terravita: The popular community of Terravita developed by Del Webb, is an 823-acre, guard-gated, golf course community in North Scottsdale, which offers world class amenities in an elegant desert setting. All residents automatically have a social membership which includes the use of the Fitness Center, tennis courts and pool. The18- hole championship golf course was designed by Billy Casper and Greg Nash. Homes range in size from 1375-4000 sq ft.
Desert Mountain: The award winning community of Desert Mountain is one of the world’s premier private residential golf communities. This master planned community covers 8100 acres. It offers its members the pinnacle in luxury real estate with rich recreational amenities. Six championship Jack Nicklaus golf courses, a tennis complex and six architecturally distinguished Clubhouses. The membership cap is 475 per course. Homes range from 1800 sq ft to 10,000+ sq ft and are priced from approximately $800,000 to over $10,000,000. Mirabel: At an elevation of nearly 3000 ft in North Scottsdale, is the private luxury golf community of Mirabel. It sits on 713 acres of pristine desert land with panoramic views of the surrounding mountains. The member owned golf club features a world class Tom Fazio golf course. The membership cap is 350. The homes found in this community are elegant southwest style homes and custom homesites are also available. Homes range from 3200 sq ft to 6000+ sq ft.
Legend Trails: The community of Legend Trails located in North Scottsdale sits on 640 acres. Within 8 distinct neighborhoods, there are 824 home sites including a 36 unit condo. Some of the neighborhoods within, are gated and others are not. Homes range in size from 1300 to 5500 sq ft. The golf course is public and there is a recreation center, tennis courts and community pool for residents. The 72 par championship 18- hole golf course was designed by Rees Jones. One Scottsdale says it all! Find all the shopping you can handle!